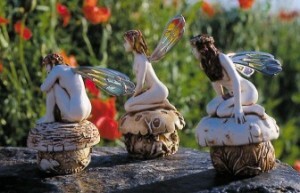 Pictured right – Faeries of the Hidden Treasures – Damosel, Fainia, and Helleborine. Designed by the internationally renowned silversmith, Robert Glover, all Isle of Gramarye pieces are made exclusively in England. They are hand-moulded from a mixture of crushed marble and resin, and also painted by hand. The faerie wings are made from English pewter and, using a special technique devised by Robert, are hand-enamelled in the ‘plique à jour’ style which gives the effect of stained glass. Gramarye is an Old English word which means ‘enchantment’, and the company drew upon this idea to create a setting for their magical pieces. The story goes that the Isle of Gramarye is the isle where the faeries and other magical creatures live. The enchantment covers the Isle itself, rendering it invisible to human eyes. 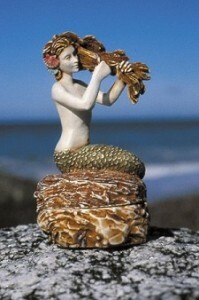 Pictured left – Mirai from the Mermaids of the Silver Shore collection. Each faerie and mermaid brings with her a tiny parchment telling her story. In the first collection, the Faeries of the Hidden Treasures, each faerie has a magical symbol within her keepsake box, and the story reveals its significance. This unique blend of craftsmanship and tale-telling sets the company apart. The concept is continued on the Isle of Gramarye website. Visitors are guided through Gramarye’s vales and forests, although certain parts of the Isle and its associated stories are only revealed to humans at particular times. Those who sign their names to the Faerie Register are emailed details of the latest news from Gramarye. Pictured right – Safe from Harm from The Faerie Children collection. However, the Guardians of Gramarye are always the first to hear the news from the Isle. 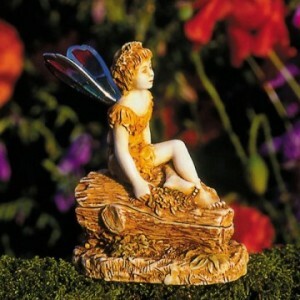 The Guardians are those who have purchased one of the faerie items and registered to receive special mailings. They are also able to use a secret password to reach otherwise inaccessible areas of the website Isle. The Guardians are the first to know about special limited editions and receive privileged offers on these and the beautiful redemption pieces. A Designer with the Royal Touch – Exclusive to World Collectors Net on the Internet.